It is a very easy Kerala style zucchini curry, that I am posting today. This curry would taste very similar to our very own vellarikka curry. I got this idea from my friend Manju Jyotish who often make this and told me to try it too. I tried it last week and loved it. It tasted almost like vellarikka curry and went along well with rice. You can use Indian cucumber instead of zucchini for the original taste. Here is the recipe. 1. Slice the zucchini into rounds and cook it covered in enough water along with slit green chillies, turmeric powder, chilly powder and salt. 2. Grind the coconut along with 1/2 tsp cumin seeds to a very fine paste. When the zucchini is almost cooked, add the ground coconut-cumin mixture and cook for a few more minutes. Switch off. Add 2 tbsp beaten curd and mix well. You can add more curd if you wish. 3. Heat oil in another pan and add the dry red chillies and chopped pearl onion. Saute until the pearl onions turn brown and then pour it over the curry. Mix well and cover with a lid for 15 mts. Serve it along with rice. 1. Substitute zucchini with cubed Indian cucumber for the Kerala cucumber/vellarikka curry. 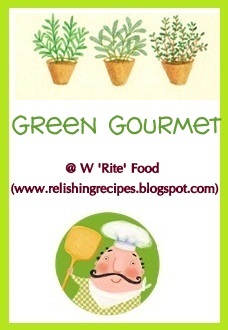 Sending this dish to the Green Gourmet Event hosted by Preeti of Write Food. Love zucchinis.This looks amazing Yummies, kandittu epol thanne kazhikan thonunund.. Wonderful curry with zucchinis..looks delicious dear…will try this. A lovely recipe not cooked zuccini in this way before.I like the addition of curd. Wow, that is a very new and yummy looking recipe. I love roasted brussel sprouts recipe as well. Will surely try it out as I have never made made anything out of brussel sprouts before. u are true! ur curry have all the look and features of a kerala curry! awesome click! Looks awesome, very nice pictures. curry with zucchini sounds interesting and delicious..very innovative recipe…thanks for sharing this! Zucchini for vellarikka curry..nice idea..will definitely try it next week..
Curry looks super delicious..love these sort of beautiful dishes..
Curry looks nice & healthy..
hai dear innale njan cheera parippu anu try cheythathu posted in my blog. zucchini curry looks nice.will try soon. one of my punjabi friend gve the zucciini mezhukkupuratti recipe and i was tried and it came out well. Hi. I would love to try this with the Indian cucumber, it looks so tempting. Zucchini curry is way delicious n i would like to try ur version soon.Hot rice n papad will make it a more delicious combo to rely on. Ready to make your mark? Wife, Mother, Blogger and above all, an ardent lover of good food. I cook, serve, and eat with almost the same passion. The divine aroma that fills the kitchen when I cook or bake is simply what keeps me going! Get all the latest recipes delivered to your inbox. Sign Up! Copyright © 2010–2019 Yummy O Yummy. All Rights Reserved. Crafted with ❤️ by Matrics 360°.